SmartHeart pairs your phone with a portable ECG device (right). Every 34 seconds someone suffers from a heart attack in the US. In the fight against this insane plague, startups are scrambling to find ways to leverage popular technology. The latest attempt is SHL Telemedicine‘s SmartHeart, a smart phone enabled electrocardiagram (ECG) device that only takes 30 seconds to analyze your heart and email the results to your doctor. Now nearly anyone can take an ECG by strapping the palm sized monitor to your chest and pushing a few buttons on your phone. No need for bulky machines, conductive gel, or an on site trained clinician. Check out the video presentation on SHL’s newest health gadget below. Aiming to come to market with a price tag near $500, SmartHeart could be an affordable way to recruit everyday citizens in the fight against cardiovascular disease. Yet as the Disrupt judges point out around 8:10, even if the technology is sound, the market for this application and hardware is uncertain. Who buys a portable $500 iPhone-enabled ECG device: remote clinicians, patients at risk for heart attack…everyone over the age of 50? When will they use SmartHeart? It’s being sold in the context of determining whether or not you’re suffering from a myocardial infarction, but wouldn’t you be racing to the hospital at the earliest signs of MI? It may make more sense with preventative medicine/regular check-up applications, but even then I’m not sure more ECGs would equate to better health. It’s very difficult for me to look at SmartHeart and know whether I’m looking at a valuable tool in the fight against heart disease fatalities, or a fancy device without a real market. On the other hand, it may not matter which SmartHeart turns out to be. It’s just another drop of water in an important flood of technology. This device is another example of how smart phones are being leveraged in telemedicine, and slowly gaining respect as a mobile medical platform. This theme has been cropping up everywhere in the past few years. Airstrip Technologies created a string of smart phone applications for easily viewing and exchanging medical images. The iPad and iPhone are becoming valuable tools for managing digital patient records. They can even help you manage your blood sugar. We may be using smart phones to detect cancer, advise us on medical decisions, and examine blood and water samples. Give it a few years and I’ve no doubt that our phones could become the most numerous and widespread medical device in the world. Whether or not SHL Telemedicine’s vision for ECGs on our smart phones turns out to be a great idea, you can rest assured that the right mobile solution for heart disease is around the corner. There are simply too many companies exploring this space for us to miss entirely. As health monitoring devices get smaller, cheaper, and faster they’ll pair up with our increasingly impressive smart phones to form the 21st Century equivalent of the Star Trek tricorder. The iPhone 4 has a back facing camera, the iPhone 8 will probably come with a defibrillator app. 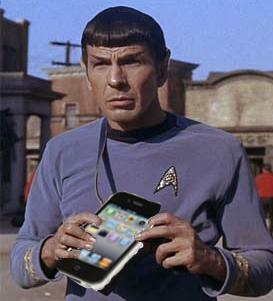 I always thought Spock would be more of an Android guy.